Home News Stendhal - Ireland’s Best Small Festival- is back in the Borough and better than ever! Stendhal - Ireland’s Best Small Festival- is back in the Borough and better than ever! 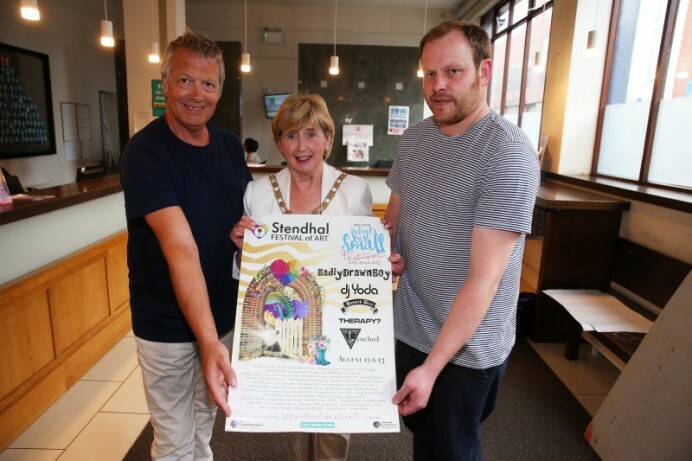 Pictured are Mayor of Causeway Coast and Glens Borough Council, Alderman Maura Hickey, Stendhal Festival Director Ross Parkhill and Stendhal Festival Technical Advisor David Boyd. Photograph courtesy of The Irish News. Stendhal Festival of Art, supported by Causeway Coast and Glens Borough Council, is back at Ballymully Cottage Farm, Limavady, 12thand 13th of August. The festival had yet another triumphant year last year, now holding Ireland’s Best Small Festival title for 2013, 2014 and 2015! The all-encompassing arts extravaganza has announced that this year there will be five headline acts to enjoy, along with over forty other musical offerings, art, craft, comedy, poetry and a bounty of all things creative. 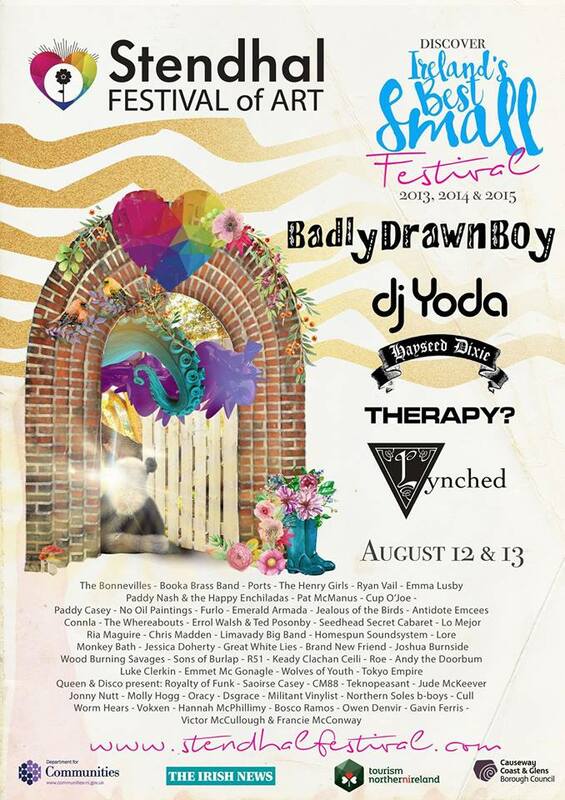 Northern Irish Alternative rock legends Therapy?, International DJ Sensation DJ Yoda, the hottest new act in folk Lynched, Bluegrass festival juggernaut Hayseed Dixie and, finally, Mercury Prize winning Badly Drawn Boy are all scheduled to light up the stage at Stendhal this year. On top of that stellar cast, the festival will also be showcasing the sensational talents of the finest Northern Irish acts which includes The Bonnevilles, The Emerald Armada, Ports, Ryan Vail, Paddy Nash and the Happy Enchiladas, The Woodburning Savages, Joshua Burnside, Lore, Jessica Doherty, The Pat McManus Band, Connla, Chirs Madden, Sons of Burlap, Andy the Doorbum and Emma Lusby and more! Festival Director Ross Parkhill said, “We are thrilled to be welcoming so many fantastic acts to Ballymully Cottage Farm again this August. “From Legendary Irish acts to emerging ones, bands who have festival experience the world over to a Mercury Prize Winner, we believe that this year’s line-up is the strongest we have ever assembled. “We strive to have as much variety in our acts as humanly possible, tick as many boxes as we can for fans of all genres and we once again will have something for everyone at Stendhal this summer. Tickets to the event are available via www.stendhalfestival.com, Ticketmaster and a host of local outlets. For further information on the festival and the full line up, visit the festival’s social media channels and website.